American engineer mission specialist astronaut 1978-1986. Grew up in Burlingame, California. Status: Inactive; Active 1978-1986. Born: 1944-06-11. Spaceflights: 2 . Total time in space: 14.08 days. Birth Place: Fresno, California. PERSONAL DATA: Born June 11, 1944, in Fresno, California, but considers Burlingame, California, to be his hometown. Married. Three children. He enjoys skiing, playing handball and racquetball, and jogging. EDUCATION: Graduated from Mills High School, Millbrae, California, in 1962; received a bachelor of science degree in Civil Engineering from the University of California, Berkeley, in 1966; and a master of science degree in Hydraulic Engineering and a doctor of philosophy in Hydraulic Engineering from Colorado State University in 1968 and 1976, respectively. ORGANIZATIONS: Member of the American Institute of Aeronautics and Astronautics (AIAA), Sigma Xi, Chi Epsilon, and Pi Kappa Alpha. SPECIAL HONORS: Meritorious Service Medal, 2 Navy Air Medals, National Defense Service Medal, Vietnam Service Medal, and 2 NASA Space Flight Medals. EXPERIENCE: From 1969 to 1974, van Hoften was a pilot in the United States Navy. He received flight training at Pensacola, Florida, and completed jet pilot training at Beeville, Texas, in November 1970. He was then assigned to the Naval Air Station, Miramar, California, to fly F-4 Phantoms, and subsequently to VF-121 Replacement Air Group. As a pilot with VF-154 assigned to the carrier USS RANGER in 1972, van Hoften participated in two cruises to Southeast Asia where he flew approximately 60 combat missions. He resumed his academic studies in 1974 and completed a dissertation on the interaction of waves and turbulent channel flow for his doctorate. In September 1976, he accepted an assistant professorship of Civil Engineering at the University of Houston, and until his selection as an astronaut candidate, taught fluid mechanics and conducted research on biomedical fluid flows concerning flows in artificial internal organs and valves. Dr. van Hoften has published a number of papers on turbulence, waves, and cardiovascular flows. From 1977 until 1980 he flew F4N's with Naval Reserve Fighter Squadron 201 at NAS Dallas and then three years as a member of the Texas Air National Guard with the 147th Fighter Interceptor Group as a pilot in the F4C. NASA EXPERIENCE: Dr. van Hoften was selected as an astronaut candidate by NASA in January 1978. He completed a 1-year training and evaluation period in August 1979. From 1979 through the first flight, STS-1, van Hoften supported the Shuttle entry and on-orbit guidance, navigation and flight control testing at the Flight Systems Laboratory at Downey, California. Subsequently he was lead of the Astronaut Support Team at Kennedy Space Center, Florida, responsible for the Space Shuttle turn-around testing and flight preparations. 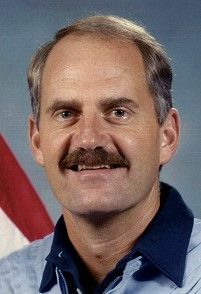 He served as a mission specialist on STS-41C in 1984, and STS-51I in 1985. Dr. Van Hoften has logged a total 338 hours in space, including 22 hours of EVA flight time. POST-NASA: Dr. van Hoften joined the Bechtel Corporation in 1986 and for 6 years managed Bechtel's engineering and construction business for the defense and space markets. He is currently Senior Vice President and a partner in Bechtel and is presently located in Hong Kong as project manager for the New Hong Kong Airport and Related Infrastructure program. SPACE FLIGHT EXPERIENCE: STS-41C Challenger (April 6-13, 1984) was launched from the Kennedy Space Center, Florida, and returned to land at Edwards Air Force Base, California. During the 7-day mission the crew successfully deployed the Long Duration Exposure Facility (LDEF); retrieved the ailing Solar Maximum Satellite, repaired it on-board the orbiting Challenger and replaced it in orbit, using the robot arm called the Remote Manipulator System (RMS). The mission also included flight testing of Manned Maneuvering Units (MMU's) in two extravehicular activities (EVA's); operation of the Cinema 360 and IMAX Camera Systems, as well as a Bee Hive Honeycomb Structures student experiment. Mission accomplished in 107 Earth orbits in 167 hours, 40 minutes, 7 seconds. STS-51I Discovery (August 27 to September 3, 1985) launched from the Kennedy Space Center, Florida, and returned to land at Edwards Air Force Base, California. During this mission the crew successfully deployed three communications satellites, the Navy's Syncom IV-4, Australian Aussat, and American Satellite Company's ASC-1. The crew also performed the successful salvage of the ailing Navy Syncom IV-3 satellite. These tasks included two Extravehicular Activities (EVA's) in which Dr. van Hoften attached to the Remote Manipulator System (RMS) performed the first manual grapple and manual deployment of a satellite in orbit. The mission also included the Physical Vapor Transport of Organic Solids (PVTOS), the second material processing experiment to be flown aboard a Shuttle for 3M. Mission accomplished in 112 orbits of the Earth in 171 hours, 17 minutes, 42 seconds. Family: Astronaut. Country: USA. Flights: STS-41-C, STS-51-I, STS-61-G. Projects: STS. Agency: USN. Bibliography: 12, 6141. 1944 June 11 - . Birth of Dr James Dougal Adrianus 'Ox' van Hoften - . Nation: USA. Related Persons: van Hoften. American engineer mission specialist astronaut 1978-1986. Grew up in Burlingame, California. 2 spaceflights, 14.1 days in space. Flew to orbit on STS-41C (1984), STS-51I..